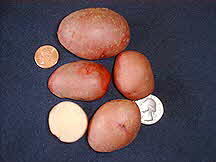 The Candy Cane potato is very oblong-shaped and medium-sized. Bright red skin at harvest makes it an eye catcher. Cream-colored or yellow interior is smooth, sweet and moist. Has a mottled ring of red just beneath the surface. A colorful and very unusual variety in appearance and flavor! A very ‘sweet’ potato.